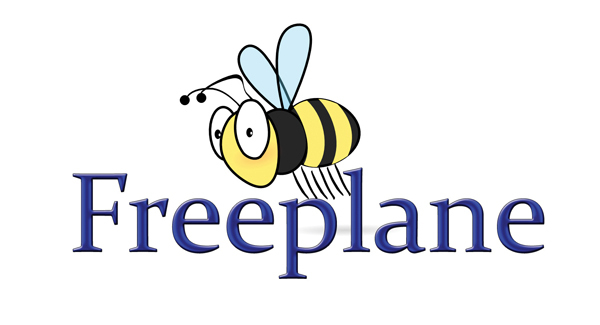 While researching the function and usefulness of the promised review on FreeMind, I stumbled up on another program called Freeplane. 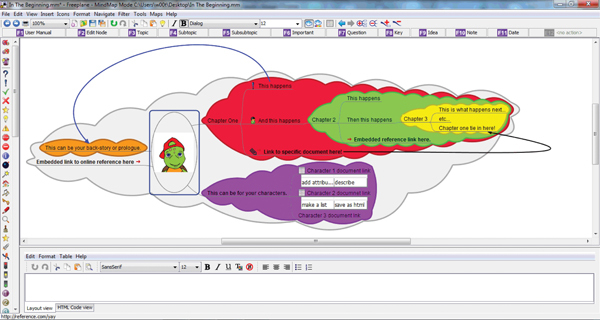 This new program contains all of the same functions as FreeMind, but with an easier-to-understand layout and even more features to play with. order-of-events approach. For this reason, Freeplane is not a replacement for OneNote. Its function is completely different. However, it does make an excellent addition to your story-building, note-taking journey, especially if you’re attempting to preplan a story’s plot. characters and story-plots in no time. The first thing you will see when you open the program is a round bubble in the middle of the screen titled “New Mind Map”. This is referred to as a ‘node’. Don’t worry, ‘nodes’ may sound weird or scary, but they’re basically bubbles in this program. The first node is the ‘parent node’, and then there are ‘child nodes’, and lastly ‘sibling nodes’. Your first bubble (node) you can title as your story’s name, the conflict, or whatever you want. Adding extra bubbles (child nodes) represents the next event to occur and helps your plot to progress. You can also add a sibling bubble to further expand the happenings of a current chapter’s events. Best of all, you can colour code every chapter or event to make things easier to understand, which isn’t available using FreeMind. Another feature that Freeplane offers is the ability to embed links to web pages or files on your computer; you can even add an image to your map. These features can be particularly useful if you would like to keep tabs on your research links and documents, without the clutter of bookmarking tons of webpages in your browser. As an added bonus, there’s also a tool called a ‘connector’. This handy addition allows you to place an arrow from one bubble to another. The reason this is so awesome is because it allows you to keep track of everything you need to wrap up at the end of your story, which I like to refer to as a ‘tie in’. For example, if you have several different things happening to your characters at once, you can point the origin of the event to the chapter of your story where the event concludes or unfolds. And because this tool can be so handy, you may end up with multiple connectors. Fortunately, Freeplane allows you to change the colour of your connector lines, too; doing this helps to prevent you from future confusion. Add everything together, and your end result is a straight-forward, easy-to-follow plot map that will help guide you through even the most complex plot. So what’s the verdict? Because this is a strange program that takes a while to get used to, Freeplane is not for everyone. It requires some patience to learn, and a bit of training to use properly. But if you have a couple of hours to spare, you should sit down and try this software out. Give it ten minutes after installation, and you’ll know the basics. Continue using the program, and pretty soon you’ll fall in love.